RICHARDSON — In Karen Hill’s eyes, not much has changed since her father’s unsuccessful bid for Richardson Independent School District's board in 1963. A. Maceo Johnson, who taught in segregated Fort Worth schools and earned the same salary as the janitors, was an “immensely qualified” person for the position, Hill said while presiding over the collection of tattered folders and discolored papers splayed across her dining table in a makeshift shrine to her father’s lifelong quest for equal representation. 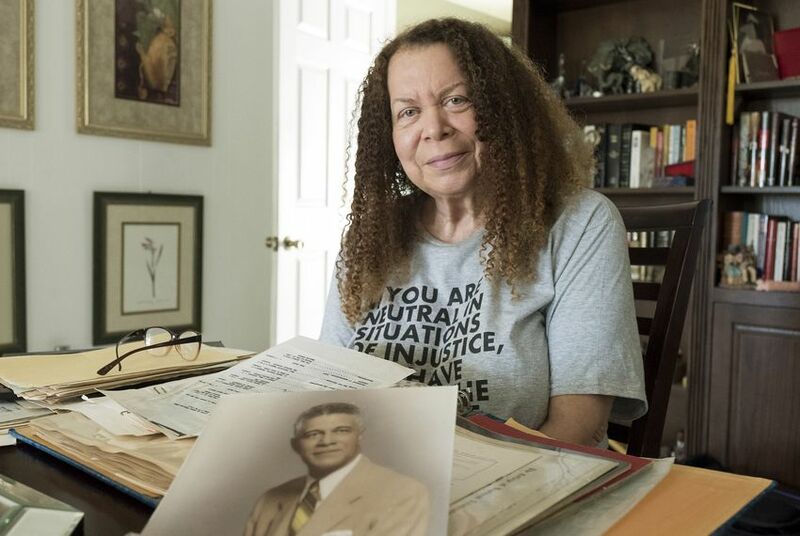 She still has the newspaper article that credited him with prodding several young Dallas men to break a long-standing barrier and become the first black members of the city’s police force. And the staff photo of the Dallas division of the Texas Employment Commission — an office he integrated when he worked there in the 1950s. When he ran for the Richardson ISD board at the height of the civil rights movement, Hill was attending the only school in Hamilton Park, a Dallas neighborhood where black people could buy new homes. But even with the support of some of the community’s white residents, the “numbers just didn’t work out” for Johnson, Hill said. Decades later, another black man, David Tyson, would go on to win the race that Johnson couldn’t and become the first — and only — person of color to ever serve on the board of Richardson ISD, where the student population is now 60 percent black and Hispanic. Tyson was elected in 2004 — a victory he says was largely made possible after the white incumbent he sought to challenge retired. Now Tyson — who served six years on the board — is suing Richardson ISD and each of its seven board members, arguing its system for electing members prevents people of color from having a fair say in who represents them. The lawsuit, filed in January and set for trial next year, is the latest in a wave of litigation against school boards in North Texas, where the influx of Hispanic families and flight of white families have dramatically transformed the racial makeup of public school classrooms. The suit aims to undo one of the last mechanisms that allow white people to keep their power in the public education system, despite their dwindling numbers in schools across the state. Richardson ISD is one of hundreds of school districts in the state — many of them in suburban areas with similarly changing constituencies — still governed by school board members who were elected at-large, with all of the district’s voters able to vote in each race. And because the state gives local school boards the authority to go from at-large to single-member election systems, white board members in those districts would have to vote to change the same systems that keep them in power. In legal filings, Richardson ISD lawyers denied most of the allegations in Tyson’s lawsuit, including “any assertion or suggestion that the district’s current at-large electoral system leaves the needs and concerns of the vast majority of the children of the district unaddressed.” A couple of months after Tyson’s lawsuit was filed, Richardson ISD officials announced an estimated $3.2 million program placing their strongest teachers in four low-performing schools. But more than a decade after Tyson’s election to the board, Hill is still convinced that any school board candidate who didn’t have support from Richardson’s white leaders would lose a contested race. “I think it would be pretty much impossible for a person to win an at-large seat unless the impetus came from the white community,” she said. In other areas of the state, civil rights activists and people of color won similar legal fights long ago, diversifying school boards that were once entirely white by forcing school boards to move from at-large voting systems to a single-member approach, in which the school district is split up and voters elect representatives for their respective geographic areas. But Richardson’s demographics are only now making such legal challenges possible under the federal Voting Rights Act. As Richardson and other Texas suburbs become less white, the legal fight in North Texas could become a harbinger of voting rights battles to come in school districts across the state. Stretching from the northern corners of Dallas into the suburban areas of Richardson and Garland, Richardson ISD has seen its once-miniscule Hispanic population become the biggest demographic group in its schools over the last few decades — a pattern that has been repeated in other North Texas communities. In 1970, Richardson ISD's student population was about 96 percent white, 3 percent black and less than 1 percent Hispanic. By last year, Hispanics had grown to 38 percent, white students had dropped to 30 percent and black students had increased to 22 percent. But a study by University of North Texas researchers in 2014 found that Hispanics were woefully underrepresented or weren’t represented at all on many North Texas school boards, even as Hispanic students comprised at least a quarter, if not a majority, of the student population in some districts. Claiming that Richardson ISD’s at-large election system functions as a “white-controlled referendum on all candidates,” Tyson’s lawsuit asks a Dallas-based federal district court to declare the system violates the federal Voting Rights Act by unlawfully diluting the voting power of people of color in the district. Despite making up less than a third of the student population, whites make up about 63 percent of the electorate in Richardson ISD. And because they tend to form a voting bloc, they wield control over every seat on the board and guide district policy “without the input of and participation from those communities from which the vast majority of students come,” Tyson’s lawsuit alleges. Proving in court that candidates preferred by voters of color are unable to win spots on the board without support from the white voting majority — one component of a stringent three-part legal test — will be key to transforming elections in Richardson, and Tyson points to himself as a prime example. An active member of mostly white civic clubs in Richardson and Dallas, Tyson was encouraged to run by a group of supporters, including a former school board president, who said they wanted a person of color on the board. He was preparing for a tough campaign, knowing that most voters would cast their ballots along racial lines. Then the incumbent he planned to challenge retired, leaving Tyson unopposed. All seven of Richardson’s current board members are white and reside in affluent neighborhoods at the edges of the school district where most residents are white. In a 2017 interview with a local publication before Tyson’s lawsuit was filed, board President Justin Bono dismissed the idea of moving to a single-member board. “I don’t know that single member districts would accomplish what proponents want or make a board more effective,” Bono said. Tyson’s lawyers point to the academic gulf between the predominantly white and affluent students at Prairie Creek Elementary and students at Carolyn G. Bukhair Elementary who are mostly Hispanic and low-income and require some form of language assistance. At Prairie Creek, nestled in a quiet neighborhood surrounded by expensive homes, about 84 percent of students were considered to be at grade level in two or more subjects in 2016-17, making it the district’s highest-performing school by that measure, according to the lawsuit. Meanwhile, only 21 percent of students met the same standard at Bukhair, which is surrounded by apartment buildings on a high-traffic road. Tyson’s challenge to the at-large system is as much about Richardson ISD’s future as it is about its past. His lawyers argue the board’s decision to keep a “discriminatory” voting system is a “relic of the district’s segregated past,” part of a long history of actions that have harmed students of color. In fact, the disparities among the district’s schools can be traced back decades, when a federal judge in 1970 ordered Richardson ISD and hundreds of others across the state to educate black and white students together, or risk losing state and federal funding. Richardson ISD vowed to integrate its schools and was required to file regular reports on the racial composition of students and staff, so the courts could track its progress. But five years into the court order, Hamilton Park Elementary had never enrolled a white student. The school board argued the segregation was unavoidable — and therefore not discriminatory — because the school was built in a neighborhood designed to house the black community. But the U.S. Department of Justice argued — and a federal appeals court unanimously agreed — that Hamilton Park Elementary had become the all-black school for students living throughout the district, not just in the neighborhood. All but one of the district’s 25 other elementary schools remained predominantly white. “It was employed as a means to perpetrate the segregated character of a school system theretofore kept segregated by other means,” a panel of judges ruled in 1975. That year, district leaders began recruiting white students from all over the district to attend the school and working to ensure every classroom had at most 50 percent black students. In the decades that followed, a fast-growing Hispanic population began to transform Richardson ISD, as many white families stopped sending their children to public schools. Because most of the district’s students are zoned to schools in their neighborhoods, the black and Hispanic families living in multi-family homes and low-income housing filled nearby schools beyond their capacity. After studying the population trends in 1995, Richardson ISD school board developed a plan resulting in the construction of four elementary schools in mostly black or Hispanic neighborhoods. Those schools are now among the lowest-performing and most economically disadvantaged in the district. Among them is Bukhair Elementary, cited in Tyson’s lawsuit to illustrate Richardson ISD’s educational disparities. Tyson was almost through his second term on the board in 2009 when Richardson ISD sought to be released from the desegregation order. Though he would later sue the board over the disparities the order was intended to fix, Tyson supported the move to end federal oversight. He knew some schools still predominantly enrolled kids of one race, but attributed the problem to residential segregation — whites and people of color were living separately, concentrated in different neighborhoods. “Is that intentional segregation or non-intentional segregation? Well, you know, how do you prove that in a court of law?” he said. After Tyson stepped down from the board in 2010, the Department of Justice’s lawyers vehemently argued the opposite in a legal brief, saying Richardson ISD had taken actions that “had the effect of furthering the segregation of the schools,” sometimes in violation of the court order. They pointed out that district leaders had drawn the attendance zones for the new elementary schools knowing that they would have mostly black students. Two of the schools — Thurgood Marshall and Audelia Creek — were opened without the court’s permission, they said. The Justice Department wanted Richardson ISD to continue busing students and transferring teachers to create schools with racial makeups more representative of the district’s demographics. Just like they had in the 1970s, lawyers for the district argued that majority black schools in Richardson were a product of forces outside its control — such as white families gravitating toward higher-priced areas where their children became the majority in neighborhood schools — not decisions by district leadership. “The location of Bukhair was designed to alleviate overcrowding as identified in the District’s 1996 study and had nothing to do with race,” they wrote in 2011. By then, the district had a more receptive audience: federal courts had stopped strictly enforcing desegregation orders as national resistance against forced busing escalated, and had lowered the legal bar for declaring school districts integrated. Across Texas, federal judges absolved school districts of their responsibility to keep schools desegregated if they could prove that demographic shifts outside of their control had re-segregated them. Judge Reed O’Connor in Dallas ruled that the district had proved it opened the new elementary schools to alleviate overcrowding in fast-growing areas, not to further segregation. A biracial committee set up by the court to oversee the district had approved the school board’s decision, he wrote. Even though O’Connor noted that 59 percent of the elementary schools were racially imbalanced — and not representative of the district’s overall demographics — he released Richardson ISD from federal supervision in 2013. “Any further efforts to desegregate are impracticable,” he said. The ruling returned ultimate control over important policies to the school board, from choosing principals to drawing schools’ attendance zones. Almost five years later, Tyson decided his faith in the board had been misplaced. He only had to drive 10 minutes from his house to see the evidence: Audelia Creek and Thurgood Marshall were around 90 percent black and Hispanic, more than 80 percent of their students were economically disadvantaged, and students regularly scored below district average on their state standardized tests. Tyson said he’d led the charge to be released from federal supervision because he believed “it was time for us to stand on our own.” He believed the community could, and would, elect more people of color to the school board. “That just didn’t happen,” he said. The voting rights fight in Richardson comes at a time when taking down at-large systems has become more legally challenging. The bulk of the litigation took place in the early 1980s, when civil rights attorneys successfully forced school districts into settlements in which they agreed to modify their election systems. But the legal standards have been raised several times in the decades since, leading to fewer cases being filed, said Jose Garza, a longtime voting rights attorney from San Antonio who helped successfully challenge dozens of at-large systems across the state. “Not because there weren't other jurisdictions that had issues with at-large elections and minority electoral success but because they became more and more difficult to do,” he added. Decades ago, lawyers had to prove that candidates preferred by voters of color were regularly defeated by a white voting bloc, that they could draw a geographically compact district in which members of a minority group made up a majority and that those voters were likely to support the same candidates. But then federal courts accepted arguments from states, cities and school boards that challengers should be required to show that they could draw a district in which people of color made up a majority of the adults — not just a majority of the population. That standard was later upped to a majority of adults who were citizens and therefore eligible to vote. In the most recent round of litigation over lawmakers’ redrawing of the state House, the U.S. Supreme Court this summer accepted the state’s argument that challengers also needed to prove the majority-minority district would “perform,” meaning voters of color would actually turn out to successfully elect their preferred candidate. In North Texas, demographics have changed enough in recent years — in part through an influx of Hispanic residents — to give voting rights advocates a chance in court, even with that increasingly narrow legal opening. Over the last several years, William Brewer, a Dallas corporate lawyer with a reputation for playing hardball, has challenged North Texas school districts and city councils to change their elections systems — and his firm hasn’t lost a voting rights fight yet. In 2013, Gloria Carrillo, a legal case manager in Dallas, suffered a bruising loss running for a seat on Grand Prairie ISD board, after she spent a lot of money and time introducing herself to voters throughout the district. She recalls being regularly advised to put just her first name on campaign signs so she could be a more palatable candidate for white voters. Immediately after she lost, Brewer Storefront, the pro bono arm of Brewer’s firm, sued Grand Prairie ISD, alleging its at-large election system violated the Voting Rights Act by undercutting the voting strength of Hispanic voters and denying them fair representation. Grand Prairie ISD agreed to settle by switching to a hybrid system with two at-large and five single-member districts; Hispanic voters were the majority in two of the districts. In 2015, David Espinosa, who is Hispanic, was elected to one of the five new single-member seats. Carrillo lost another race in 2016, then won one of the two at-large seats in 2017. The formerly all-white board now has two Hispanic members — in a school district that is majority Hispanic. “We all felt the fact that the lawsuit had happened allowed a Hispanic to come onto the board,” Carrillo said. In 2014, Brewer Storefront successfully forced Irving ISD to replace its 5-2 hybrid system with seven single-member seats, including one district in which Hispanic voters held the majority. A year later, they sued Carrollton-Farmers Branch ISD, which replaced its at-large system with a cumulative voting system in which voters can cast as many votes as there are seats. Since then, two people of color have been elected to the board. Brewer said he learned the hard way that appealing to the community to change discriminatory policies would not always be effective. In 2006, his firm led a community awareness campaign against a Farmers Branch housing ordinance that discriminated against immigrants by requiring them to prove they were in the country legally in order to rent a home or an apartment. Brewer and his team knocked on doors and encouraged people to oppose it. But Farmers Branch voters and city leaders supported the ordinance anyway; Brewer Storefront then joined several civil rights organizations that got it shut down in federal court. “We lost and we resorted to the courts, because we knew that the courts were there to protect all of the people in our community, not just some,” Brewer said. Despite the Hispanic population growth in Richardson, the case for single-member districts can’t depend solely on that community. Although Hispanics make up a quarter of the total population within Richardson ISD’s boundaries, they only make up about 11 percent of those eligible to vote. So Brewer, now representing Tyson, is trying another argument. One district could be drawn in Richardson ISD with blacks, a “unified group that votes cohesively as a bloc,” as the majority of eligible voters, Brewer said. He’s also proposed that a second district could be drawn with a majority made up of a combination of black and Hispanic eligible voters. The case is set to go to trial in June. The district has hired John Alford, a political science professor at Rice University and one of the state’s go-to experts for defending Republicans’ map-drawing against similar Voting Rights Act challenges. Alford is expected to try to disprove that voters of color in Richardson ISD vote cohesively and that a white voting bloc regularly defeats their preferred candidates. A separate expert will take on the voting districts that Brewer argues can be drawn within the school district to give voters of color a majority. But the larger arguments in favor of keeping at-large school board elections are largely rooted in concerns that single-member systems result in community polarization, said Bob Heath, an Austin-based attorney who has defended cities and school boards against such legal challenges. That’s why cities and school districts facing legal challenges often end up pushing for a hybrid system that keep some at-large seats held by people who represent the entire district, Heath said. After all, he said, offices from the U.S. House of Representatives down to Texas county commissioners have long been elected from single-member districts. “It is not a foreign election system, yet school districts and cities have been resistant to that change,” he said. 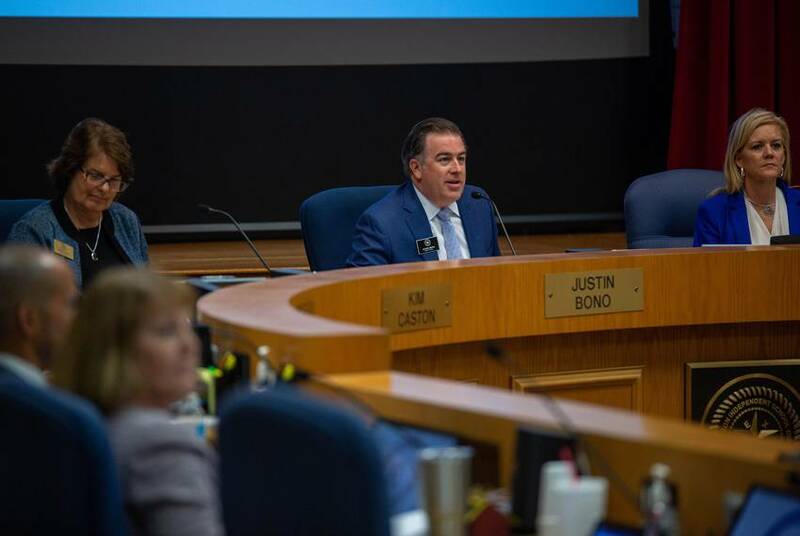 It remains unclear whether Richardson ISD will follow other North Texas school districts and agree to settle the case by modifying its voting system to include at least some single-member seats. For now, Tyson remains the only person of color to serve on the district’s seven-member board. Last year, he watched eagerly as Ben Prado, a Hispanic Richardson High School graduate, ran for an open board seat. But in May 2017, Prado lost his race, garnering the lowest share of the votes against three white candidates. Tyson sued the district seven months later, spurred in part by Prado’s loss. He says he’s sure that more candidates of color will emerge once the district is rid of the at-large system that he argues discourages people of color, or the candidates they prefer, from competing. In the 2018 election, no black or Hispanic candidate ran for a position on the board. Disclosure: The University of North Texas has been a financial supporter of The Texas Tribune, a nonprofit, nonpartisan news organization that is funded in part by donations from members, foundations and corporate sponsors. Financial supporters play no role in the Tribune's journalism. Find a complete list of them here.